This is the first notification of Cycling Ireland Off-road Commission Annual General Meeting (AGM). This meeting will take place on Saturday 21 October 2017 – venue to be confirmed (Dublin based). The commission will be made up with the following 8 positions. Apart from the position of Chair (which is a two year post) all of the posts are up for re-election. The seasons are changing, summer is coming to an end so it must be time for cyclo-cross!!! The calendar of events we have had confirmed to the commission so far are shown here. The age categories for cyclo-cross are based on the age group you will be in next year. For the 2017/2018 cyclo-cross season the list of age categories by year of birth is shown here. The commission has also been working to get the technical rules reviewed for cyclo-cross. Part of this review looked at race length for youth riders. Statement below. Please find below details of the selection process for Cycling Ireland license holders to compete in the 2018 UCI Cyclocross World Championships in Valkenburg, Netherlands (3-4 Feb 2018) and also the World Cup, Hoogerheide, Netherlands (28 Jan 2018). Selection takes into account a rider’s domestic and international performances throughout the season and their commitment to cyclocross. Athletes must also adhere to Cycling Ireland’s anti-doping policies. Expression of Interest to join the Irish Cyclocross Development Squad. Applications are being sought from Under 14, Under 16, Junior and Under 23 riders, both male and female, who wish to be considered for inclusion within an Irish Cyclo-cross Development Squad. The primary element of developing cyclo-cross riders in Ireland is the belief that the best pathway for international cyclocross success comes through strategic season planning, goal setting and cyclo-cross specific coaching and development. The goal of the Irish Cyclo-cross Development Squad is to see improvements in international competition with the longer term aim of making an impact in World Championship and World Cup events. 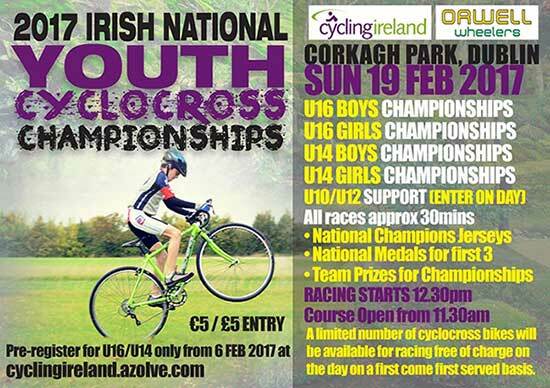 The first Youth Cyclo-cross National Championships (U16 & U14 Boys and Girls) will take place on Sunday 19th February 2017 at Corkagh Park, Dublin. The event will be hosted by Orwell Wheelers. The championship categories are Under 14s and Under 16s. There will be support races (non championship) for Under 6s, 8s and 10s. This is the second notification of Cycling Ireland Off-road Commission Annual General Meeting (AGM). This meeting will take place on Saturday 21 January 2017 – Carlton Hotel Dublin Airport. Meet at 11:30 with start time at 12:00. The 2016 Irish National Cyclo-cross Championships are due to be held on Sunday 10 January. The event organisers from host club Dromara CC with the venue confirmed as Tollymore Forest Park, County Down. Download the Technical Guide (v4a) here. Round 3 of the Fixx SuperCross cup brought the riders to Ballawley park south Dublin. Heavy rains all week had flooded parts of the course and made them unusable. However as Sunday came around the course had dried out, and the Supercross team had marked out an excellent testing course for the riders. Punctures and rear mech destruction brought an end to some people’s race, but not series leader Robin Seymour who went on to take a commanding victory over Sean O’Tuathail and Tim O’Reagan. At the race start Seymour was led out of the start by young rider Paddy Michel who had a strong start, and went on to claim victory in the junior category.. The post Win for Seymour at Round 3 appeared first on Fixx Supercross Cup. 2014′s Tymon park Supercross event saw the return of the “Spriral of Confusion, and some excellent new course modifications to ensure close tight racing from a packed out race. With over 100 riders in the B race alone, approximately 80 in the A race and new for the SuperCross event was the kids race which saw over 50 kids of all ages. In the main race it was Ray O’Shaughnessy who took off like a bolt of lightening to lead the first lap, with the rest of the field starting to form into chasing groups. It wasn’t long however before the winner of round 1, Robin Seymour pushed through to the head of the race, and worked hard to stay away from Sean O’Tuathail chasing in 2nd, Sean who was the winner of last weeks round of the Ulster CX series is really finding good form this season despite having a cold, and there was clear air between him and the chasing pack lead by Antóin “Zippy” Ó Dúill. In the Ladies A race it was another strong performance by Fran Meehan to take the win, with Natalie Grieve in 2nd. The post Tymon Report appeared first on Fixx Supercross Cup.